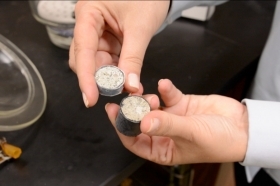 Fiber-enforced, concrete like rocks have been discovered in a dormant super volcano in Italy which led scientists to believe that there is a natural process resulting in materials similar to man-made concrete. The ‘natural concrete’ was discovered at the Campi Flegrei volcano near Naples and is remarkably similar to Roman concrete which was used to construct the still-standing Coliseum, the Pantheon and various shipping ports throughout the Mediterranean. 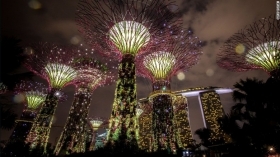 The city-state is the greenest city in Asia, according to one report even with 100 % urban development. Singapore’s building codes and regulations ensure that any new construction work can adequately replace the greenery that was taken out. Their buildings harvest rainwater for use in gardens and are built with solar panels to generate power. Singapore provides an ideal model for any nation and can be particularly useful for Trinidad and Tobago. Are Potholes a Thing of the Past? Researcher Abir Al- Tabbaa and her colleagues at Cambridge University have created microcapsules that act like scar tissues in human bodies. These capsules will be mixed into cement and can ‘heal’ the cracks that appear in the concrete structure. Other research teams at Bath and Cardiff are also working on similar means of producing ‘smart concrete’ that can revolutionize the cement industry in the future. Rayden Rampersad, the Nation's reigning chess champion in the under-8 category, participated in this year's CARIFTA Chess Championship held in Barbados. Trinidad Cement Limited (TCL) is proud to have been his sponsor in this event. One of the youngest local players, the Claxton Bay resident represented Trinidad and Tobago, winning second place in the Under-8yrs category of the CARIFTA chess event. Rayden was also granted a World Chess Body rating from the Fédération Internationale des Échecs (FIDE). New regulations in Washington D.C would force the closure of cement plants in small, rural communities. The proposal by the Environmental Protection Agency (EPA) to tighten Ozone standards could result in the loss of more than 45,000 construction jobs each year amongst other economical disasters. An optimal joint configuration has been developed for concrete overlays, the panels are 6 feet long by 6 feet wide by 6 inches thick; 6 x 6 x6. This standard configuration minimizes moment axle loadings, which in turn, reduces slab curling. And so the term "ultra thin whitetopping" is out. BCOA, for bonded concrete overlay of asphalt, is in. BCOAs are one of five freshly designated variations of concrete overlay designs. 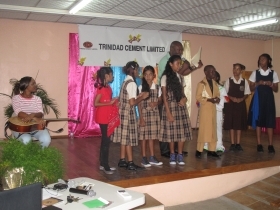 Trinidad Cement LTD ( TCL) will be assisting with this year's annual Junior Achievers program. The program is aimed at Form 4 students across the nation and TCL's participation will comprise of both a Sponsorship component and weekly mentorship of one of the participating groups. Claxton Bay was the site of the first ever Trinidad Cement Limited Calypso Competition. The "Claxton Bay and Environs Primary School Calypso Competition" was held on Wednesday 11th February at the Macaulay Community Centre. The participants hailed from four schools: Claxton Bay Anglican Senior Primary School, Macaulay Government Primary School, St Margaret's Government Primary School and Union Presbyterian Government School. When working with fresh concrete, care should be taken to avoid skin irritation or chemical burns. 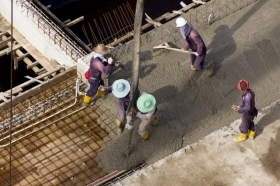 Prolonged contact between fresh concrete and skin surfaces, eyes, and clothing may result in burns that are quite severe, including third-degree burns. If irritation persists consult a physician. For deep burns or large affected skin areas, seek medical attention immediately. In case of house construction in built up area, give proper protection at the excavated area including fixation of signboard and lighting arrangement to avoid the fall of any passer-by into excavated portion. The home owner should insure all construction safety measures before laying cement concrete because sometimes the contractor uses old decayed ‘ballies’, small pieces having joint in ballies, white ant affected batten and decayed planks which are not able to take load and create mishap and even take the life of labor. Home owner should ensure that the movement of people is banned near working area by making barricade etc. because during dismantle of old building the contractor tries to dismantle the portion without having safety measures which may cause hurt to laborers or passers-by. Water storage tank built for general use and curing should not be much deep to avoid fatal incidence of falling laborers’ children into the tank. The length and breadth of the tank may be increased without increasing its’ depth if required. The steps should be provided in the water tank. From home construction safety point of view the home owner should encase electrical wires with plastic pipes or by bamboo strips to avoid accident occurred due to the touches of iron bars with electric wires at the time of bending and binding MS steel bars on the roof since in some cases electric power lines pass near the house. All these are common home construction safety tips which can be applied for good life of any construction project. Did you know that it's important to have a proper system for channel water away from your house and towards the appropriate drain ways. Standing water can cause a wide variety of problems, none more damaging or costly than the problems it can cause with a home’s foundation. It also depends on what type of water is standing around the foundation. Rain water collecting and pooling up around the foundation of a home can, believe it or not, enter concrete. Concrete foundations are porous, and water fills in any pores it can find. Over time, the water can seep into the concrete foundation and ultimately break down the concrete. This break down will cause the foundation to crack, which will in turn cause foundations to shift and the home to become unsettled. Cracks in the ceiling or wall in the inside of the home can be a symptom of a foundation affected by standing water. Concrete is easy to work with: versatile, durable and economical. By taking a few basic precautions, it is also one of the safest building materials known. Relatively few people involved in mixing, handling and finishing concrete have experienced injury. Outlined below are some simple suggestions - protection, prevention, common sense precautions - useful to anyone working with portland cement and concrete. Construction Dust - Are you at Risk? Large construction and small at home projects using cement, all carry some dangers. It is important to understand the risks and precautions necessary when using Cement to ensure complete safety. There are several advantages to using Concrete for road ways as opposed to Asphalt. Below we explore some of those positives.